Despite their name, Red-cockaded woodpeckers are mostly black and white with a large, bright white cheek patch and a bold black stripe on the lower border of the check. The common name came into use during the early 1800’s when ‘cockade’ was regularly used to refer to a ribbon or other ornament worn on a hat. Female Red-cockaded Woodpeckers (RCWs) lack the red cockade. Juvenile males have a red ‘patch’ in the center of their black crown. This patch disappears during the fall of their first year at which time their ‘red-cockades’ appear. The Red-cockaded Woodpecker (RCW) is a territorial, non-migratory species. The RCWs social system is more complex than most species of birds; individuals live in groups normally consisting of a breeding pair and zero to four male (rarely female) offspring from previous years. These offspring, know as “helpers” assist in incubating eggs and brooding and feeding nestlings produced by the breeding pair. The RCW social system is referred to as a cooperative breeding system, that is, the breeding pair receives assistance from offspring in the raising of young. In mid-April, the female RCW usually lays a clutch of three to five white eggs in the breeding male’s roost cavity. Eggs hatch after 10-12 days of incubation (among the shortest incubation in birds) and nestlings fledge from the nest cavity 24-27 days after hatching. RCW nestlings are altricial, that is, they do not have feathers when hatched and their eyes are not open. They require a lot of care from parents and helpers who will feed the nestlings and clean the cavity of waste during the nestling period. In contrast, quail are precocial; they hatch fully feathered and are able to feed themselves when led to food by the parent. After fledging, the nestlings continue to be fed by adults for up to six months at which time the majority of fledglings disperse from the territory where they hatched. Mortality is high (68%) for female fledglings as they disperse to search for breeding vacancies. Male fledglings either disperse or remain on their natal territory to become helpers. Annual mortality is also high (57%) for male fledglings. Although re-nesting may occur if a clutch or brood is lost, RCWs typically have only one successful nesting attempt annually. Double brooding (two successful nests in one breeding season) has been documented but is extremely rare. The diet of RCWs consists mostly of insects in the egg, larvae and adult stages. These include beetles, ants, roaches, spiders and other insects found in or on pine trees. Fruits and seeds make up a small portion of the overall diet. Methods of foraging include flaking away bark and probing under the bark using their specialized forked tongue to extract insects. Large, older trees are preferred for foraging. In general, males forage on the limbs and upper trunk while females forage on the trunk below the crown. This division of foraging area is most noticeable in winter when insect numbers are at their lowest and their activity slows due to cold weather, making it harder for RCWs to detect prey. Differences in the foraging behavior of males and females may help to reduce competition between them when food is scarce. The RCW is the only North American woodpecker to excavate roost and nest cavities in living pine trees. While longleaf pine is the preferred species for excavation, other species such as loblolly, shortleaf, slash and pond pine are also used depending on the local forest type and tree species availability. The use of live pines as roosting and nesting sites may have evolved in response to living in a fire maintained ecosystem where frequent fires, primarily in the growing season, eliminated most standing dead pines (snags). Longleaf pine is thought to be preferred by the woodpeckers because it is the most fire-adapted of the pines. Longleaf pine has a unique ‘grass’ stage when young, producing an abundance of long green needles that burn during ground fires, thus protecting the growing stem. Longleaf also produces more resin when wounded than other pines, making them more resistant to insect outbreaks such as the southern pine beetle. RCWs use this increased resin flow for cavity defense by chipping holes, called ‘resin wells’, above and around the entrance to the cavity as a defense against predators. Rat snakes, skillful at climbing trees, are the main predators of RCW nests. Resin flow produced by the wells creates a physical and chemical barrier that impedes the snake’s movement up the tree. The birds also scale the outer bark off the tree above and below the cavity entrance, exposing sapwood around the cavity entrance forming a ‘plate’ around the cavity. Resin flowing from the wells created by the RCWs may eventually coat the trunk, thus making the cavity tree conspicuous from a distance, giving it a candle-like appearance. Each member of the group roosts in a separate cavity. Cavities are excavated in mature pines, generally over 80 years old. Cavity excavation takes one to six years. The birds slowly excavate through the resinous sapwood before reaching the relatively sap-free heartwood. RCWs choose older trees for cavity excavation. They need trees mature enough to have sufficient heartwood for a cavity free of sap and because many mature trees are infected with red heart fungus. This fungus softens the heartwood and allows for easier excavation of the roosting chamber. Individual cavities are known that have been used by RCWs for over six generations, or approximately 30 years. The aggregate of cavity trees used by a group is referred to as a ‘cluster’. The cluster consists of one to numerous cavity trees; trees may contain new cavity ‘starts’ and completed cavities. Cavity trees within a cluster may be ‘active’, currently being used by a RCW, or ‘inactive’, not being used by a RCW. Besides being unique among North American woodpeckers, red-cockaded woodpeckers are ‘primary’ cavity nesters, meaning they are responsible for the construction of cavities. In the southern pine ecosystem there are many ‘secondary’ cavity users that benefit from the RCWs work. RCWs are considered a ‘keystone’ species because use of their cavities by these animals contributes to the species richness of the pine forest. At least 27 species of vertebrates have been documented using RCW cavities, either for roosting or nesting. Species include birds, snakes, lizards, squirrels and frogs. Many of these species, for example wood ducks, only use the cavities that have been abandoned by RCWs; abandonment usually occurs because the entrance tunnel was enlarged by pileated woodpeckers. However, southern flying squirrels, redbellied woodpeckers, redheaded woodpeckers, eastern bluebirds, brown-headed nuthatches, tufted titmice and great crested flycatchers are the species most commonly seen in RCW cavities, and can use normal, unenlarged cavities that RCWs could also use. RCW cavities are a valued resource for many species and competition occurs for their use. 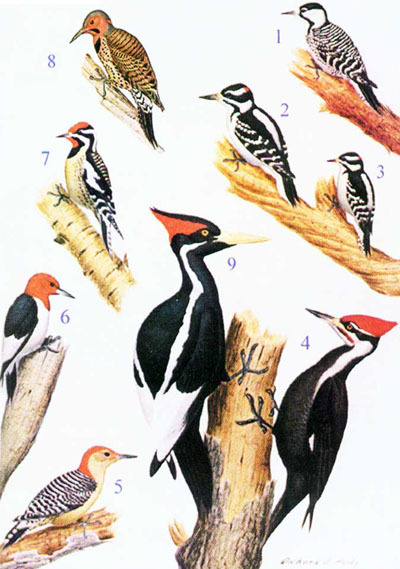 The RCW shares the southeast with seven other species of woodpeckers (see below). Only the RCW has the white cheek patch. Other woodpecker species, including the red-bellied, red-headed, pileated, northern flicker and yellow-bellied sapsucker, can be distinguished from the RCW by either having very noticeable red on their head or lacking the black and white bars on the back. - from Thomas M. Imhof’s “Alabama Birds"
The Red-cockaded woodpecker is a nongame species with no hunting season. It is federally and state listed as endangered. Federally listed species are defined as any native or once native species of wild animal whose continued existence as a viable component of the state's fauna is determined by the U.S. Fish and Wildlife Service to be in jeopardy or any wild animal determined to be an "endangered animan" pursuant to the Endangered Species Act. There are no reported problems with this species. Landowners who want to implement land management techniques that benefit red-cockaded woodpeckers in exchange for regulatory assurances that no additional Endangered Species Act restrictions will be imposed as a result of their management actions can learn more about the North Carolina Red-cockaded Woodpecker Safe Harbor Program. Red-cockaded Woodpeckers (RCWs) were once considered common throughout the long leaf pine ecosystem, which covered approximately 90 million acres before European settlement. Historical population estimates are 1-1.6million “groups”, the family unit of RCWs. The birds inhabited the open pine forests of the southeast from New Jersey, Maryland and Virginia to Florida,west to Texas and north to portions of Oklahoma, Missouri, Tennessee and Kentucky. The long leaf pine ecosystem initially disappeared from much of its original range because of early (1700’s) European settlement, widespread commercial timber harvesting and the naval stores/turpentine industry (1800’s). Early to mid-1900 commercial tree farming, urbanization and agriculture contributed to further declines. Much of the current habitat is also very different in quality from historical pine forests in which RCWs evolved. Today,many southern pine forests are young and an absence of fire has created a dense pine/hardwood forest. The primary reasons for the decline of the RCW include loss of habitat and fire suppression. This reduction of suitable habitat has caused the number of RCWs to decline by approximately 99% since the time of European settlement. At the time of its listing as an endangered species, the RCW had declined to fewer than 10,000individuals in widely scattered, isolated and declining populations. Today there remains about 5,600 groups or 14,000 birds. Most populations were stabilized during the 1990’s due to management based on new understanding of RCW biology and population dynamics. However, there are still populations in decline and small populations throughout the species’ current range are still in danger of extirpation. In 1983, approximately 63% of all known RCW clusters, active and inactive,occurred on public lands in North Carolina. Those clusters that occur on private property are typically in isolated islands of habitat and many of the mare likely no longer active. Reports from the early 1990s stated that of 25clusters on non-federal lands that were active in the early 1980s, only six were still active in 1990. Furthermore, of 352 longleaf pine remnants examined in North Carolina, only 91 stands(26%) were being maintained by fire, while the rest (74%) were fire-suppressed and in transition to other forests types. In the absence of fire, fire-intolerant hardwoods will encroach upon pine savannahs and flat woods creating a dense midstory and canopy, shading out grasses and forbs, and consequently, creating unsuitable habitat conditions for RCWs. Within North Carolina, the majority of RCW groups and the largest remaining populations are found on Fort Bragg, Sandhills Game lands, Camp Lejeune, Croatan National Forest, and Holly Shelter Game lands. The North Carolina Natural Heritage Program (NCNHP) maintains a database of reported active and inactive RCW clusters in North Carolina. That database relies on voluntary disclosure by property owners of RCW clusters; therefore,some occurrences on non-federal lands likely remain unknown. 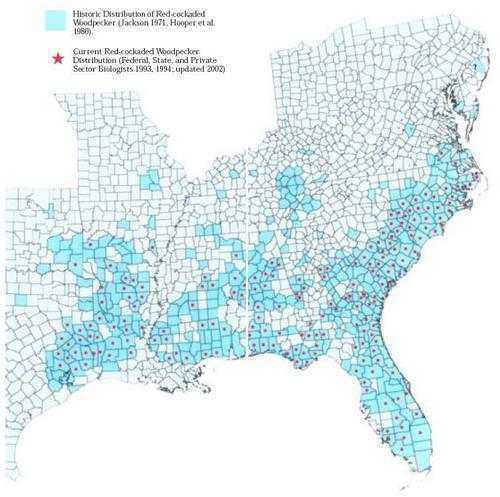 In January 2005,NCNHP data indicated that 46 RCW clusters having a last observed active date of1995 or more recent occurred on non-federal lands in North Carolina; whereas if you include those with a last observed active date of 1990 or more recent, the number of clusters rises to 183. Those clusters that have since become inactive may still have potential to be restored. An additional 269 known records of cavity trees and/or RCWs are in the NCNHP database as occurring on non-federal property. Some of these historical records may have restoration potential but many either no longer exist or are too geographically isolated to provide a conservation benefit. North Carolina currently has 19.3 million acres of forested lands statewide.The majority of those lands (76%) are owned by non-industrial private forest owners with another 12.5% managed by industrial forest owners and approximately5% of forests managed by state and local governments. Approximately 6.2 million acres are pine dominant forests and two thirds of those acres are managed using natural regeneration techniques or are managed for other forest uses. Although RCWs are known from a variety of pine forest types in North Carolina, the open longleaf pine forests of the Sandhills and Coastal Plain regions of North Carolina are currently the strongholds for the species in North Carolina. Geographically and demographically isolated RCW groups in fragmented habitats that are not managed for the species' benefit have a low probability of persistence. The probability of persistence is affected not only by habitat deterioration and demographic uncertainty, but also by proximity and connectedness to other populations to facilitate dispersal between populations.Very small populations of at least 10 groups may persist over the short term(i.e., 20 years) if their individual foraging habitats are aggregated by shared boundaries. However, a population of five or fewer groups would likely be extirpated without intensive habitat management and immigration in the same number of years. The need for an accurate, concise population census is important to the survival of these isolated groups. Without the knowledge of their existence and the specific habitat management that they require, these populations are likely to decline, and may eventually cease to exist. Small, isolated, and genetically important RCW groups do exist on non-federally owned lands in North Carolina; however, exact numbers are not currently known. It is anticipated that, through the involvement of non-federal property owners in a Safe Harbor Agreement, a better understanding of the current status of RCW populations on non-federal land will be achieved.Property owners and managers have expressed interest in, and support for, a mechanism that will provide long-term conservation benefits while removing some Endangered Species Act (ESA) related restrictions. A healthy, productive Red-cockaded Woodpecker (RCW) population is also an indicator of a healthy southern pine ecosystem. RCWs and southern pines both evolved in a fire-dominated system. Many other species within this system show adaptations to fire. The most prominent adaptation of RCWs is their use of living pines for cavity excavation. The history of fire in the southeast has a natural and human component. Research has suggested the ecosystem evolved in response to slow-moving ground fires started by lightning strikes, which occur more frequently in the southeast than anywhere else in North America. Most fires started by lightning strikes occur in the spring and summer growing season, when thunderstorms are more prevalent. Native Americans and later European settlers used fire to clear land and improve hunting grounds. However much of this burning was accomplished during the winter, the non-growing season. Frequent fires created an open forest, with large pines, little to no mid-story, and a diverse herbaceous ground cover; described by many 19th century naturalists as ‘park-like’ because they could easily ride horses and wagons across the land. Many of the ground cover plant species show adaptations to fire and are termed ‘pyrophytic’ or ‘fire-loving’. For example, wire grass is a highly flammable bunch grass, typically producing seed only after a summer growing season burn. Because of its unique fire-loving properties, the biodiversity of herbaceous ground cover in longleaf pine forests is among the world’s highest. Degradation and loss of habitat led to the rapid decline of RCWs. Conservation and management of adequate habitat is central to recovery goals. Quality habitat includes forests with trees old enough for roosting, generally at least 80-120 years old, depending on species of pine. Hardwood midstory results in cluster abandonment; therefore, it is critical that hardwood midstory be controlled. Prescribed burning is the most efficient and ecologically beneficial method to accomplish hardwood midstory control. Either mechanical and/or chemical treatment may also be required for initial control of the midstory. Foraging habitat must also consist of a forest of older pines with little or no midstory. Each RCW group uses from 75-200 acres of foraging habitat. The acres used depend upon habitat quality and population density. For example, a park-like forest of older, larger pines and open understory is of higher quality than a dense forest with many small, young pines. The area required for RCW foraging on high quality sites is less than sites of lower quality. However, habitat management for forage and cavity trees must include the development of a young age class of pines to insure the necessary older trees for future generations of RCWs. The application of controlled burns is essential in keeping the structure the forest beneficial to RCWs. Drilling holes that mimic natural cavities and . Installing boxes called ‘inserts’ within a suitable tree. Increasing genetic diversity in critically small populations. Typically, two types of translocations are conducted: a female juvenile is moved to a solitary male group; and an unrelated male and female juvenile are moved to a ‘recruitment’ cluster in hopes of establishing a new group. Recruitment clusters are established by installing artificial cavities in unoccupied but suitable habitat. Refining translocation techniques has made this an invaluable tool for recovery. The most important component, quality habitat, consisting of open park-like pine forests, suitable nesting and roosting cavities, and adequate foraging habitat, must be in place before translocations are conducted. - from USFWS brochure "Red-cockaded woodpecker". Available here (PDF).